“I love thrifting day” recap + pictures of our finds! This past Saturday was so fun! Getting a bunch of ladies together to go shopping is fun… but get a bunch of frugal/spray-paint loving/thrift store loving ladies together (who all actually read my blog and many other blogs too) to go thrift store shopping is A BLAST! I am changing things up a bit this week on the blog – so today will be my “Friday Frugal Finds” post and I will share a recipe on Friday. Because I couldn’t wait to share all of our finds from Saturday’s trip and I knew a lot of you were anxiously awaiting this recap too! So I was a horrible blogger and didn’t get many pictures of our actual shopping time (maybe because I was too busy shopping myself). Then we headed to my favorite parking lot yard sale (in the parking lot of an antique mall). It wasn’t as big as it has been in past weeks and my jewelry man wasn’t there, but we did manage to find some good finds. Probably the best booth was one that the antique store was actually running. They have many items left behind in booths where people don’t come back and pick them up or don’t pay their rent so they drug a bunch of stuff like that out and were selling it for CHEAP! Like 25¢, 50¢, and $1 cheap! Nikki picked up a stack of really nice stack of matching white frames with white matte’s (basically brand new with some nice photography in them – had prices of $10-15 on each one) – for 50¢ and $1 each. 4 forsythia stems (price tags still on them from Michael’s at $2.99 each) – 25¢ each. There was another great parking spot where the guy was selling everything for 50¢ each! I picked up 2 hard back books, a crystal candy dish, and a wood bowl for $2.00 total. Judy got a ton of great finds too which I will show you at the end. Then we headed to Rockmart Thrift Store. This was smaller store where not everything was priced. But I have to tell you, I actually really like those stores because it usually means you can NEGOTIATE! I really liked these lamps and the fact that you could get a matching set. I am not quite sure what I am wanting yet for our bedroom, but a spray painted version of a ceramic lamp like this may be what I end up doing. This is also the kind of store where you kind of have to dig – but then again, I actually really enjoy those stores! Lots of treasures in this back room – see that huge brassy chandelier on the floor? Melodie saw past the grime and imagined what it would look like in her master bathroom. It wasn’t priced and we all agreed that she shouldn’t pay more than $8 for it. So she went to ask the cashier how much she wanted for it – $3.00!! Steal of a deal! I have a light fixture that same style just smaller that I bought for $4 at Goodwill. I spray painted it ORB (oil rubbed bronze) and it hangs in my entryway. Can’t wait to see Melodie’s transformed fixture in her space! Martha got this huge wood sign that was so perfectly distressed already. I would have totally bought it if I would have seen it first but we didn’t fight over it – LOL! It had a $3.00 price tag on the back but Martha offered $2 and the lady said that was fine! And I couldn’t pass up the cute baby Curious George book for my nephew. It was in brand new condition and I paid 39¢. The next thrift store, Repairers of the Breach, was MASSIVE! We could have literally spent ALL day in this thrift store. I might have to do tour through it later here on the blog. It was another one of those not many things priced/dig for your finds kind of place. BUT they were negotiable and the prices were fantastic! Chandra picked up these 2 lamps (can’t remember how much she paid?). The one on the right is very Ballard/Anthro looking – almost looks like it had a telescope mounted on the back. She plans on converting it for Edison bulbs – will be so neat when she is done! Maybe she will send me a picture! America book – has gorgeous pictures and will be a perfect coffee table book! – I think she charged me $1.50 for this. We had lunch a little coffee/deli right in our historic square called Square Perk – it was really yummy! And we had fun chatting about our finds and things we were working on in our home. These girls weren’t ready to stop shopping after lunch either! We all went to my local fabric store and a few of them got some pieces. Then Martha and I ran by my flea market on the way home. It was HOT, we were all tired when we got home, but we had so much fun! And got all kinds of treasures! I have to show you all of Judy’s finds – she emailed me a picture when she got them all unwrapped at home. She paid less than $25 for all of this. Didn’t realize she was a dish lover like me and she racked up on Saturday! The tall white shutter was a $1 from the yard sale booth. The book was $1 or so at Repairers of the Breach. I think she got the square plate, the red pie dish and the red square container at Goodwill along with the file box thing. Now the best part – the tall black plate rack, the black metal holder with the 3 bowls, and the rack with the green, red and cream dishes (perfect colors for her kitchen)were all from the yard sale. I think she paid $8 for ALL of that! Now the plates on the tall plate rack didn’t come with it – she just bought the stand. BUT then she was on a mission to find plates to fit it. At Repairers of the Breach they had PILES and PILES of plates (and probably 500 coffee mugs – LOL!) Although she wasn’t able to find a matching set she did fine 3 little salad plates that all coordinate. I LOVE that she mixed and matched the plates – definitely has a vintage feel. Each plate was 10¢ – 50¢ each. So she paid like $2 for the stand and less than $2 for the plates – GREAT deal! I showed you Martha’s finds already – she paid less than $8 for all of this. I paid less than $20 for all my finds. I will say it again – we had SOOOO much fun! One of the things we talked about was doing something with all of our finds SOON (and not just letting them sit un-spray painted or unused). So in spirit of that, I hope to show you 1-2 projects later this week with some of my finds. And for all of you that live local that were out of town, or sick, or had other plans – all the girls told me we definitely needed to do this more than just once a year. So we are planning on doing another thrift shopping trip when it is a little cooler. Maybe the weekend after Labor Day, Saturday, September 8th?? So tentatively mark that date down and I will announce the official date later. 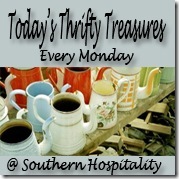 Did you participate in “I love thrifting” day this weekend? Even if you just went on your own in honor of the day? I would love to see some of your finds – link to your post or tell me about them in the comments. Off to go spray paint my owl, urn and do a tray makeover! Yay, what fun treasures! I hit the jackpot at 2 goodwills and many yard sales. Sharing my post tomorrow! And, September would be fun. Maybe I could come then! Wow, you had so much FUN! I am really jealous. I don’t know anyone around here who is interested in doing the thrift store visiting just for fun thing. Such hauls you and your friends had. And yep, in total agreement that maybe some kind of “deadline” or contest maybe? should be put in place so that you and your kindred shopees (is that a word?) will reveal the uses of their (and your) finds in all their glory! Would love to see it. BTW, I really enjoy your blog. Jan recently posted..Is Chartreuse the New Turquoise? The prices at these places you visited are fantastic! For a hardcover book at our GW they charge a 1.00 and .50 cents for paper back! I love the one lamp your friend found! You all had such a nice thrifty day! Christina, as soon as I finish those lamps (and a few other projects) I will send you pics! Let me know the next time you do another outing. It was a great day! Looks like you had lots of fun!! Wish I could’ve come too! Fun to see what you all got. I think we had that America book at my house growing up. I wish I knew what ever happened to that. Enjoy. Looks like you all have plenty to keep you busy…at least til next weekend anyway! Hope you’ll stop over sometime and visit me at Quirky Vistas!